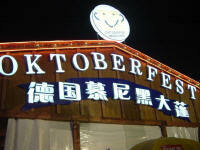 Thursday, July 28 was the grand opening of the China International Beer Festival 2005. The festival is held annually for a week and a half at Xinghai Square, a mere ten minute walk from our apartment. However, the word “international” is dubious. The adjective could be interpreted to mean the beers are international, which would be true. But if you interpret it to mean that the festival is international, and people come to Dalian from all over the world to drink beer in Xinghai Square, that would be a stretch. But it’s a stretch the organizers desperately try to make. In order to ensure that foreigners would be photographically visible at the festival, specific invitations were issued to western teachers at the English schools in Dalian. That is how Zac and I, along with some other western teachers, scored coveted seats at a prestigious VIP banquet on the opening night of the festival. The dinner was held in a red-carpeted banquet hall in the brand new convention center, adjacent to Xinghai Square. 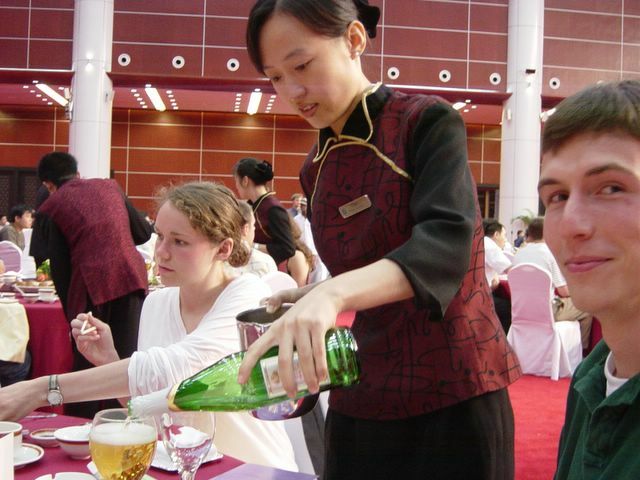 While several officials gave speeches, well-dressed cuisine logistical engineers whisked around the room filling wine glasses with beer and pouring tea. After the speeches, our dinner began to miraculously appear in one exquisite dish after another. All the while, we were being entertained by a variety of Chinese musicians and one “international” group playing some German music, thrown in for good measure. There was only one painful performance, given by a small boy who was some sort of Chinese opera prodigy, singing what surely must have been “the ode of the dying goat.” When the dying goat was finally put out of its misery, the mostly-Chinese audience heartily applauded for much different reasons than me. After the dinner, all of the guests got into large vans to be transported to the special VIP area of the square, to watch fireworks, drink free beer, and be photographed. This is where the foreigner publicity plan ran amuck. The foreigners, unable to understand the announcement to go out to the vans, were late to organize themselves and reach the vehicles. Our group finally got out to the last bus, which didn’t have enough room, and reminiscent of Namibia, we had to literally sit on each other to fit. The end result being that it took a long time and the van was separated from the motorcade and couldn’t get in through the festival gate without the proper permit. Being the impatient, ill-informed foreign mob that we were, we abandoned the van and Chinese bureaucracy and decided to try and make our own way into the festival, VIP tickets or no. We joined the crowd pushing at the cattle chute, were quickly enfolded into the mass, eventually churned through and found ourselves in the midst of an alcohol dynasty. The festival basically consisted of outdoor bars set up for every kind of beer, each with a stage for various types of performances. We never made it to the VIP area, undoubtedly to the disappointment of the paparazzi, who had to track us down elsewhere. We wandered around and mused at Chinese hip-hop dancers in plastic red outfits, a pair of girls on roller skates who swung each other around using ropes, a magician, some Russian line dancers, and barmaid modeling shows. Wherever two or three westerners gathered, a camera man was sure to be among them, taking photos and doing brief interviews consisting almost solely of the question, “Where are you from?” The implication, when put on TV or in the newspaper, would be that the foreigner was a tourist who traveled to China specifically for the “international” beer festival. The festival is China’s blatant imitation of the Munich International Beer Festival and aspires to reach the proportions of Oktoberfest. But fortunately, copying DVD’s is easier than copying festivals, and the event still had a definite Chinese flair. I haven’t been to the Munich festival to compare, but I doubt that it is has inflated red arches everywhere and illuminated “WC” signs suspended in mid air by helium balloons in a desperate attempt to keep people from using the lawn as a toilet. An awning with the word “Oktoberfest” and girls wear German barmaid outfits thankfully did little to take the Chinese out of China. For me, the beer festival illuminates some of the dissonance that I notice in China right now. The Chinese often assert their uniqueness while at the same time maintaining a prolific culture of imitation and pandering to western approval. They are exceedingly proud of their 5,000 year history, yet they neglect cultural development in the name of economic development and modernization. They are so concerned with rising, caught up in the inertia of progressing, that they sometimes seem to forget to consider what they are, not just where they are going. So what is China now? Is it more than a booming economy? I think it is—and the beer festival is an example of some of that unrealized potential. The festival is well organized, big, loud, fun, and full of local talent. It is a place where foreign residents and Chinese nationals intermingle at tables packed with beer bottles. It failed to emulate the Munich beer festival, but by inadvertently retaining its Chinese characteristics, it became something distinct and enjoyable. So what if tourists around the world don’t flock to Dalian to drink beer? Who cares? The important thing is that a hundred thousand Chinese and expats came out on a Thursday night to do what they do best: sit outside drinking beer, shoot off fireworks, sing, dance, and generally have a good time with their friends and family. I think that’s a picture worth taking.